Posted by randydeutsch in architect, architect types, architecture industry, books, career, change, employment, identity, management, optimism, questions, reading, software architects, the economy, transformation. Today’s post will be brief: I have a presentation to edit and packing still to do. But I would be remiss in leaving town without first letting you in on a brand new book that I just read that I predict will take you and the architecture profession by storm. Before reading further, grab your wallet. You’ll need it by the time you get to the sixth line of this book review. Why you never heard of him: He’s a recent architecture graduate with 5 years experience as an intern and has built little. Why that shouldn’t matter: You will be hearing a lot more of and from Eric J. Cesal. The consensus: This may well be the best book by and for architects ever written. And (to my wife’s chagrin) I own and have read them all. Who should read this book: Out of work architects. Architects thinking of leaving the profession. Architects who have left the profession but want back in. Former architects who have left the profession for good but on deep, dark nights lie sleepless in bed wondering if they made a wise choice. Neighbors of out of work architects who wonder why they wear a tie when taking the dog out for a walk. Anyone who has ever had to wear a tie. Katherine Darnstadt would like this book. Parents who find their recent grads living once again under their roof. Or in their tent. Employers. Architect’s spouses, friends, relatives and roommates. Architects who think they might have a story to tell but question whether anyone will care to listen. Architects who are considering doing a tour of duty helping the world in some selfless way while they wait out the Great Wake. Architects who think they may be the next to be let go. Architects who sometimes wish they were the next to be let go. Architects who read architecture blog posts in hopes of finding someone who deeply, passionately understands their situation. Architects. Why you should get it: This book speaks to you where you hurt. Cesal is wise beyond his 31 years (33 today) and whip smart. He knows what matters and he (and no doubts his talented editors) cut to the chase. Why you should get it now: The sooner you read it, the sooner we’ll all be out of this mess; the sooner you’ll decide to stick it out in architecture; the sooner you’ll find a place for yourself in this new world. Why you should read it: Cesal wrote the book during a period of unemployment. Nearly every architect – employed, underemployed and unemployed – can relate. Why else you should read it: Cesal names the Great Recession the Great Wake. What will linger long after you’re done reading the book and give it to your colleague to read: The author’s voice. What this book could also be used for: Like a commonplace book that soldiers used to carry around with them for reassurance and companionship on the front lines, you can keep this book nearby on your own detour of duty. Why I love the book: Interjected throughout the book are short personal essays describing the author growing up, personal incidents and events that helped shape the architect/ author/ artist/ humanitarian he has become today. I love how the book captures timely subjects (the co-opting of our title by others) and timeless ones. I am most impressed by the way the author maintains a line of thought, without jumping around from subject to subject: a real feat and welcome revelation in contemporary writing. Like the late, great architect and author Peter Collins, Cesal asks hard questions and isn’t afraid to linger in them until he offers a solution. Why this book may not be appropriate for all audiences: There’s an excruciatingly painful scene involving a tooth being pulled. Alcohol plays a part in a number of chapters. 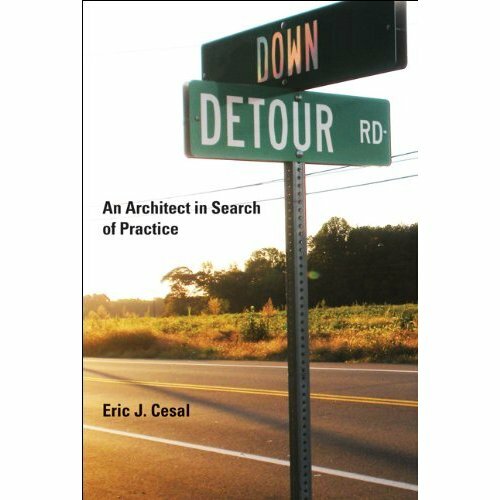 Why I think Eric J. Cesal is architecture’s answer to Dave Eggers: Down Detour Road: An Architect in Search of Practice is A Heartbreaking Work of Staggering Genius if it were written for architects. Favorite passage from the book: The author’s attempt to find work at a temp agency. (p.117) Priceless. The author’s education: Three master’s degrees in four years: business administration, construction management and architecture from Washington University in St Louis. What book you might compare Down Detour Road with: During the deep recession of the 1970’s we had Harris Stone’s incomparably endearing and well-illustrated Workbook of an Unsuccessful Architect (available here for a penny.) But let there be no doubt: Down Detour Road is our age’s Let Us Now Praise Famous Men by Walker Evans and James Agee. This book is our The Worst Hard Time: The Untold Story of Those Who Survived the Great American Dust Bowl. Someone famous the author hangs with but doesn’t once mention in the book (very classy): Cameron Sinclair, co-founder and ‘chief eternal optimist’ (CEO) for Architecture for Humanity. The author’s solution: Cesal recommends that we have to come to some hard truths about the limits of what we do “and then leap beyond those boundaries.” He goes on to describe 10 types of architects. What are the ten architect types he writes about? The financial architect; The value architect; The risk architect; The paid architect; The idea architect; The knowing architect; The named architect; The citizen architect; The green architect; The sober architect. He refreshingly doesn’t over-use capital letters and dedicates a chapter to each architect type. What it says on the dust jacket: As the world redesigns and rebuilds in the face of economic and ecological crises, unprecedented numbers of architects are out of work. What does this say about the value of architecture? That is the question that confronted architect Eric Cesal as he finished graduate school at the onset of the worst financial meltdown in a generation. Down Detour Road is his journey: one that begins off-course, and ends in a hopeful new vision of architecture. Like many architects of his generation, Cesal confronts a cold reality. Architects may assure each other of their own importance, but society has come to view architecture as a luxury it can do without. For Cesal, this recognition becomes an occasion to rethink architecture and its value from the very core. He argues that the times demand a new architecture, an empowered architecture that is useful and relevant. New architectural values emerge as our cultural values shift: from high risks to safe bets, from strong portfolios to strong communities, and from clean lines to clean energy. This is not a book about how to run a firm or a profession; it doesn’t predict the future of architectural form or aesthetics. It is a personal story—and in many ways a generational one: a story that follows its author on a winding detour across the country, around the profession, and into a new architectural reality. Where you can find the author today: Port-au-Prince, managing and coordinating Architecture for Humanity’s design and reconstruction initiatives in Haiti until 2012. No, really, where can you find him: You can find him here. But seriously, he lives in Haiti with a family of two dogs, 11 chickens, 5 cats and a goat named Newfie. Read more about it in the Huffington Post here. What does the word “detour”mean in the book’s title: de·tour, n.
1. A roundabout way or course, especially a road used temporarily instead of a main route. 2. A deviation from a direct course of action. Likelihood that the book will be made into a movie: Very good odds. I’m not a betting man but I’d bet on it. Final thoughts: Someone get this guy a MacArthur Genius Grant. And a second one to The MIT Press for having the foresight and gumption for publishing this staggering piece of exceptional writing from an otherwise little known entity. Cesal may very well be doing wonderful, necessary work in Haiti but we very much need him here back home with us. What to do while you wait for your copy of the book to arrive: Tell everyone you know to read Down Detour Road: An Architect in Search of Practice. LOL And a very good friend of architects at that! Thanks Bruce for visiting and for the accolades. I’ll lend you my copy when I get back in town. Well, you certainly convinced me! Clicked on Amazon and ordered the book; eager to read it and will pass on to my (disillusioned)architect husband right after I’ve finished it! Thanks Pat – I don’t think or your husband will be disappointed. I have found it helpful to have a “third party” point of view to refer to when discussing the situation architects face. After you have both read it I would love to hear what you thought. Nice book report. Thanks for sharing! I’m heading to the bookstore.